A push to remove confederate monuments has swept the news in the past few months. This has sparked debate and dialogue across the nation, drawing attention to civil war history. The conversation extends from what the monuments themselves represent to the intention behind the civil war. It is important to acknowledge these issues today, and therefore it is also valuable to see how far back this conversation extends. The Civil War lasted from 1861-65. While groups like the Sons of Confederacy try to push the message that the war was fought over states’ rights, historians cannot deny the major role that slavery played in the war (Dew). This debate and the attempted historical erasure is important to recognize at the heart of the monument debate. The question that remains difficult to answer is if Confederate monuments represent a system of oppression or simply the fallen soldiers in battle. In Portsmouth Virginia, Trinity Church put up a stained glass window that can be seen here. Camp’s disgruntled tone carries over into his lyrics as well. To camp, this monument was respectful of the soldiers who gave their lives in battle. However, it is clear that others saw the monument as a symbol that individuals were so invested in systems of oppression that they were willing to give their lives for it. This connotation casts monuments such as these in a different light. 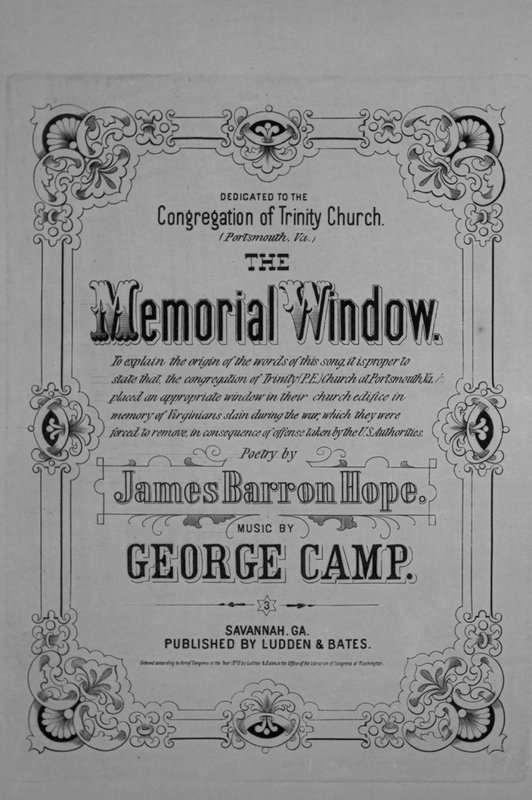 Unfortunately, a recording of Camp’s “Memorial Window” does not exist. Nevertheless, I felt compelled to write about this object because of the political parallels that it seems to cary through to today. It has been 145 years since the 1872 debate of the window in Portsmouth Virginia, but the citizens are still trying to decide what to do with similar objects. In the past few weeks, the Mayor of Portsmouth has voiced a desire to move a civil war monument from the center of town. The story is covered here. I hope that highlighting examples such as these shows that efforts to combat racism and oppression need to be constantly pursued. These issues have been discussed in our country for a long time now. Dew, Charles B. Apostles of disunion: southern secession commissioners and the causes of the Civil War. Charlottesville: University of Virginia Press, 2016. Camp, G., & Hope, J. B. (1872). The Memorial Window. Savannah, GA: Ludden & Bates. I am so. impressed. with this post. I’m always a fan of linking music history to our political present, and your writing does exactly that with care and panache. On the one hand, it’s unsurprising that composers erected their own “monuments” to fallen Confederate soldiers and to the Lost Cause. On the other hand, I’d never seen an example of such commemoration in sheet music, so it’s fascinating and surprising and slightly horrifying to see that here. I don’t know how you found this (I would like to know!) but I am really grateful that you did. Keep up the great work!